The discussions in section 8.3.1 and 8.3.2 have shown that both MRF-based region segmentation and active contour model-based object contour tracking algorithms have unavoidable problems when applied in real applications such as automatic blood vessel lumen segmentation in MR sequence. In this section, we present a new framework for image segmentation, which integrates the advantages of MRF and active contour models and overcomes some of problems from each of them. Also, this framework is sufficiently flexible for additional prior knowledge to be plugged in so as to be adapted to various applications. Note that the closed contour of the desired object is found by linking the sections of curves between each pair of adjacent initial points. 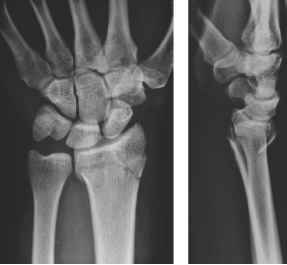 These points are usually static in the optimization process and are very critical to the overall contour shape in the final result. To guarantee the accuracy of these initial points, human interaction is usually involved in MPA model based applications [73, 76, 77]. In the proposed framework, a new scheme is designed to automatically find these initial points, which will be called "control points" in the following context as a distinction of those defined in previous active contour models. 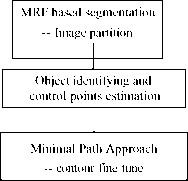 The control points are identified from the boundary points of the desired object in the MRF based region segmentation result under maximum reliability criterion. The basic structure of the framework is shown in Fig. 8.7. In step one, the QHCF procedure is applied to each of the input image to obtain a reliable region-based segmentation of the whole image. Then an object identification procedure is conducted. This is the step where prior knowledge of the desired object can be applied, and approaches such as the decision tree, fuzzy logic reasoning, neural networks, morphological operations, and so on can be employed in the design. Figure 8.7: Structure of MRF-based Snake model. Once the object of interest is identified, a procedure of optimal control point estimation operates among each section of its boundary points. Initialized by those control points, an instance of MPA model is setup and the optimal contour of the desired object is obtained.